A beautiful pair of gold hoop earrings from Bulgari. 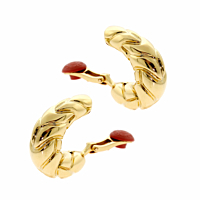 These half hoop earrings feature 18k yellow gold and a clip-on style that is suitable for everyone. The gorgeous and delicate design is elegant without being too simplistic. These earrings are a great addition to any jewelry collection and are sure to add a touch of the fabulous to any outfit.